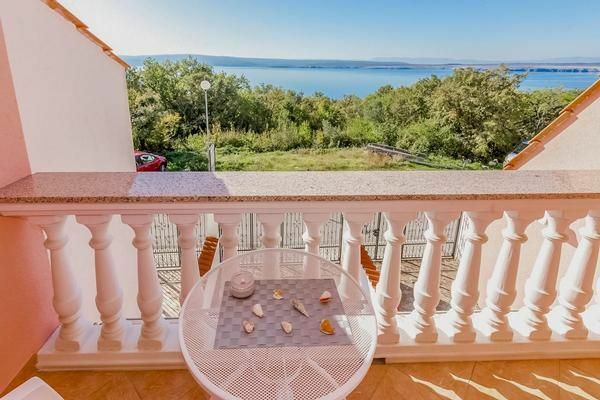 House Kamelija is located in the beautiful Dramalj area, near popular Crikvenica. Its location outside the city centre makes it a peaceful oasis perfect for relaxation. The house consists of two floors. Downstairs there is a terrace, a living room, a hall, a bathroom, a kitchen and a terrace on the back side of the house. Upstairs there are two bedrooms (one with a big bed for two, and one with 2 separate beds which can easily be transformed into a double bed), a hall, a bathroom and a terrace. There is a couch in the living area which can be transformed into an extra sleeping space, if necessary. You have the entire house at your disposal during your stay. You may also use the pool in Vila Oleander (house next door) for free! - Kosten: einmalig pro Person Kosten in Höhe von 4 EUR (obligatorisch). - Elektrogrill: pro Objekt und Woche Kosten in Höhe von 15 EUR (optional). Electric Grill (per property per week, the tenant bring 15 EUR). Cot (per property per day, included 5 EUR). Air Conditioning (per property per day, included in the price 10 EUR).